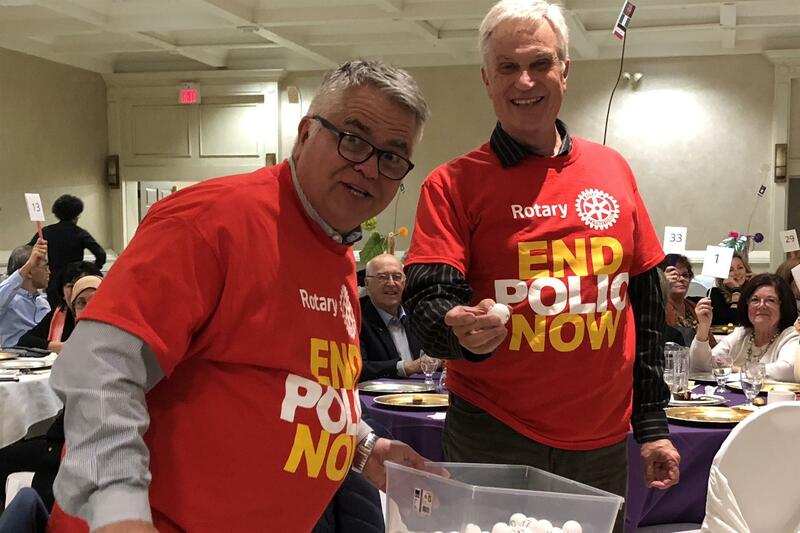 Rotary International established October 24th as World Polio Day over a decade ago, and last night our Club held our annual Fundraiser (along with thousands of other Rotary Clubs worldwide) to help End Polio Now. Everyone in attendance at our Pigout for Polio event, run this year by new chair Susan Falodun and her committee, had a great time! Held at Fogolar Furlan Club of Windsor, all guests, including District Governor Paul Sincock and Past District Governor Bob Gallagher (thanks for attending!) enjoyed an evening of fun, great food and fellowship. Thanks to Elder Theresa Sims (traditional Indigenous Knowledge Keeper) as she thanked creation by singing and playing the traditional drum, to Major Paul Rideout for his invocation, to President Elect Gord Faas for heading the toast and to past Pigout chair Nick Bibic for leading us in the recitation of the 4 Way test. The new “Auction Lottery” format was a huge hit, with Greg DeHetre and Peter Hrastovec enticing everyone to participate. For more pictures from Pigout for Polio 2018, click here.